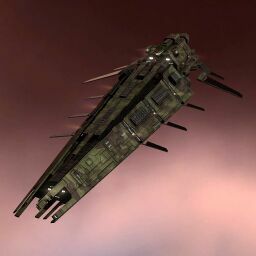 The Hurricane Fleet Issue is a faction battlecruiser. It has been likened to the old Hurricane before the Retribution nerfs, with 8 high slots, 6 turrets and sufficient powergrid for two medium energy neutralizers. With some extra EHP to boot, it's a nice upgrade over the standard Hurricane, though the high price means older characters may be wanting to look into the higher DPS Sleipnir instead. Minmatar Battlecruiser to V to properly take advantage of the Hurricane Fleet Issue's massive DPS buff that comes with every extra level in the skill. Drones V, Combat Drone Operation V, Drone Interfacing IV and Gallente Drone Operation I/Minmatar Drone Operation I are all are important for getting as much DPS out of the 50m3 bandwidth as possible. The appropriate skills required for fitting a Full T2 Armour or Shield Tank#Tank. No sub-article about Hurricane Fleet Issue roles or piloting tactics. You can write them here. No notes for the Hurricane Fleet Issue. This page was last modified on 14 March 2018, at 14:06.